This map is linked to a map I previously drew. 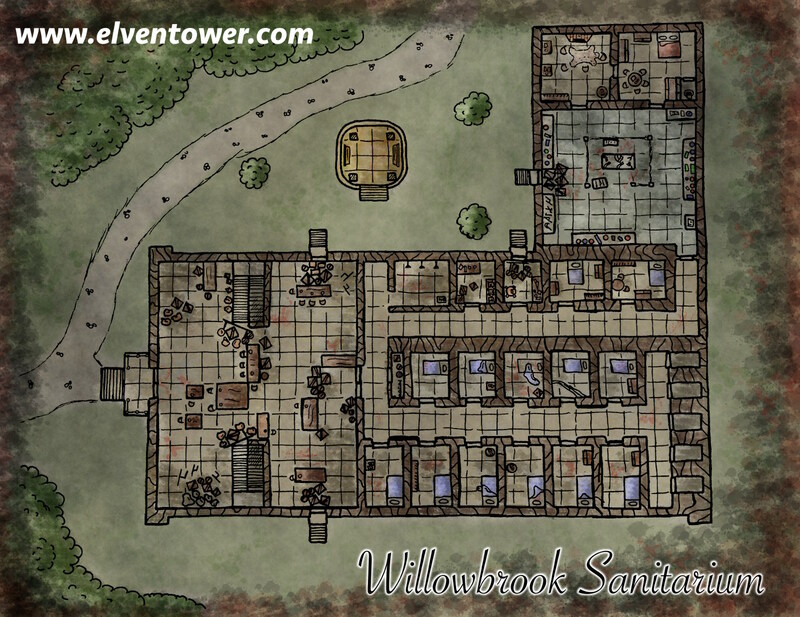 Willowbrook Estate shows the layout of all the area, in it you can see the sanatorium from afar. This is a close up, detailed map of the sanatorium itself. Willowbrook Sanatorium is home to mentally insane, family outcasts, and personality malformed individuals. The place works almost like a high security prison, but due to understaffing and increasing “accidents”, all accesses to the facility have been barricaded. Only the frontal door is used. Violence is a daily situation in this place, patients attacking each other, or the hospital’s staff. The staff, outnumbered by violent patients, have been forced to use violence to stay in control, they use weapons and brute force; unfortunately, their numbers have dwindled. The most dangerous and aggressive patients are secluded in the solitary confinement cells. The hospital chief is reluctant to simply kill the overly threatening patients, instead of that. He came up with a surgical procedure to make patients more “calm”. He is performing crude transorbital lobotomies to patients. His procedure is still very experimental, some subjects have died already, while the “success” subjects have become docile. They lose all kinds of motivations and strong emotions. Now they are like a slowly growing herd, easily managed by the nurses. This is a very sandbox scenario, PCs objectives can range from: let’s destroy this place, let’s make it better, let’s find out what is making them crazy to let’s stop that evil doctor. Alternatively, the lobotomized subjects can work like “zombies” in control of the chief doctor. There could also be an entity, maybe a demon or aberration that is making the already insane patients even more aggressive than usual.